World of Shorts Berlinale 2015 issue is out! The English-language short film-centred magazine, World of Shorts (WOSH) evolved in 2012 from the blog of Budapest-based short film platform Daazo.com. The copies of WOSH are available at the short film events and screenings of A-list film festivals. The new issue of the magazine appears in February 2015, focusing on the short film programmes of the Berlin International Film Festival. 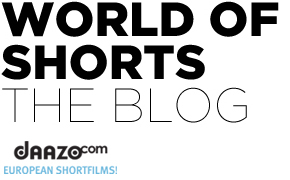 Besides introducing some of the short film events and related workshops and programmes taking place at the film festival, World of Shorts discusses the topic of storytelling and story editing. As in earlier editions, one of the central aspects of the magazine is visual creativity. This is why this issue features the popular Mapping your Mind section where the filmmakers selected for Berlinale Shorts tell about their films with drawings. In addition to this, the magazine features interviews with Berlinale Shorts curator Maike Mia Höhne; last year’s Golden Bear winner Caroline Poggi; Berlinale Talents alumnus and director of The Petting Zoo (selected for the Berlinale’s Panorama section this year) director Micah Magee; and the new programme director of the Berlinale Talents Florian Weghorn. There are academic-minded articles as well as about storytelling and story editing, plus a festival panorama and a workshop agenda. The curator of Berlinale Shorts, Maike Mia Höhne shares her thoughts on this year’s programme. The print issues of World of Shorts can be found at the venues of the Berlinale Shorts screenings and of the Berlinale Talents. Previous postClash of the generations - Interview with Jure Pavlović Next postThe BFI Future Film Festival is coming!